Columbia River Gorge is an area of immense beauty. Steep walls of basalt and temperature rainforests frame the wide waters of the Columbia River. If you like waterfalls, great news! 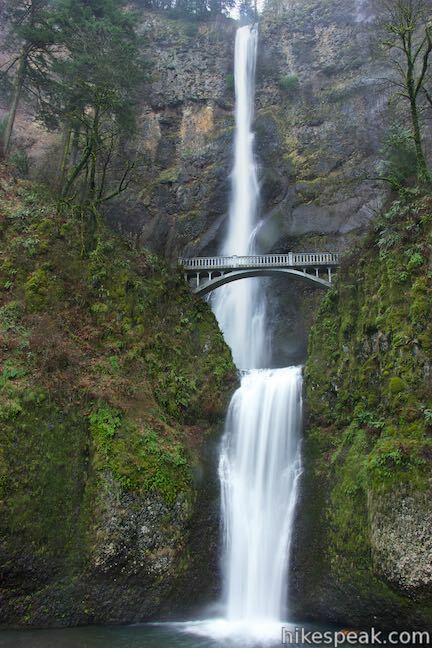 The gorge is absolutely packed with waterfalls, including Multnomah Falls, the tallest waterfall in Oregon. Columbia River Gorge is about 60 miles long, beginning near The Dalles where the Deschutes River joins the Columbia River and ending east of Portland. The north side of Columbia River Gorge is in Washington and the south side of the gorge is in Oregon. This state-straddling gorge is preserved by several Washington and Oregon State Parks as well as Columbia River Gorge National Scenic Area, which encompasses 292,500 acres. Popular hikes on the Oregon side of the Columbia River Gorge include Multnomah Falls Trail, Eagle Creek Trail, and Angel’s Rest Trail. The area’s less well-known trails are great too, often observing spectacular waterfalls. How did this beautiful place come to be? Columbia River Gorge was shaped during the Missoula Floods at the end of the last ice age over 12 million years ago. Ice dams breached on enormous glacial lakes, causing unfathomable amounts of water to rush down the Columbia River and carve out the landscape. This collection of trails in Columbia River Gorge lists hikes from east to west. The table may also be sorted alphabetically or by distance to help you pick your next hike. Each trail links to its own report complete with photos, GPS maps, directions, and all the other information needed to locate and enjoy these hikes. An interactive map below the table shows the location of each hike. Visitors have other ways to enjoy Columbia River Gorge. This iconic Oregon viewpoint is a National Natural Landmark with tremendous no-hiking-required views of Columbia River Gorge. Visitors can stay overnight in Columbia River Gorge. The main campground in this state park on the Washington side of the gorge has 26 first-come first-serve campsites in a forest setting. Just east of the Columbia River Gorge, this campground at the bottom of the Deschutes River has 34 sites with electrical hookups, 25 more primitive sites, and 4 group sites. What will you find under the canopy of Forest Park? Dirt single tracks weave through verdant woodlands, passing Douglas firs and bigleaf maples bedecked with licorice ferns. Explore some of Forest Park's charmingly ridges and ravines on this 3.5-mile loop with 510 feet of elevation change. Although Wild Cherry Trail and Alder Trail are the most notable members of this hike, this circuit... Read more.